Brew hot water and Dilmah Green Tea with Natural Lemongrass for 2 minutes. Once cool, add sugar syrup and consommé to the tea. Infuse tea in hot water for 2 minutes. Strain. Brush mould with ginger syrup. Thinly slice cucumber and lay into moulds. Fill with chilled mint tea and one mint leaf to garnish. Rim the glass or tea cup with cucumber sherbet. Dress the glass/cup with a slice of cucumber, two mint ice cubes and ginger caviar. 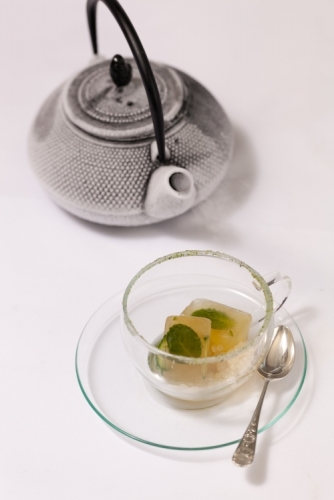 Strain chilled Dilmah Green Tea with Lemongrass into a teapot through dry ice to create to a steaming hot pot. Pour on top of the ice cubes and caviar.